……….I love getting new books for our collection. With an ever-decreasing book budget, I have to decide between replacing stolen or worn out copies of popular books (Go Ask Alice, Of Mice and Men, Thirteen Reasons Why, Speak) or ordering new/ popular titles (The Fault in our Stars, The Maze Runner, Just Listen, If I Stay). I also have to consider the research needs of our students, and, therefore, search for books that address current controversial issues such as online security, marijuana legalization, gay marriage, climate change and ongoing issues like immigration, abortion, and poverty. ……….Furthermore, today there are also many good writers who cover science, history, political theory, economics, social studies and just about every other intellectual niche. There are great books about past presidents, revolutionaries, inventors, trailblazers and ordinary people who did amazing things. Who could have imagined that someone could write an interesting book about Cod or Salt? Mark Kurlansky, that’s who. Beyond the University: Why Liberal Education Matters, by Michael S. Roth. Looking like the enemy: My Story of Imprisonment in Japanese American Internment Camps, by Mary Matsuda Gruenewald. Fabricated: World of 3D Printing, by Hod Lipson & Melba Kurman. “Fabricated tells the story of 3D printers, humble manufacturing machines that are bursting out of the factory and into schools, kitchens, hospitals, even onto the fashion catwalk. Fabricated describes our emerging world of printable products, where people design and 3D print their own creations as easily as they edit an online document. … Fabricated takes the reader onto a rich and fulfilling journey that explores how 3D printing is poised to impact nearly every part of our lives … Aimed at people who enjoy books on business strategy, popular science and novel technology, Fabricated will provide readers with practical and imaginative insights to the question ‘how will this technology change my life? …” from the Wiley publishing (publisher’s site). “This meticulously researched, brutally honest, compelling book offers readers a different way to look at many events over the past 200 years or so. The title says it all. From the slave trade through abolition; from revolutions (American, French, and Haitian) to the Louisiana Purchase; from the decline of honey to the rise of saccharine, these events and many more are directly traced to the cultivation and production of sugar cane around the world. With a focus on slavery, Aronson and Budhos demonstrate how this one crop, with its unique harvesting needs, helped to bring about a particularly brutal incarnation of slavery.” … from School Library Journal, by Jody Kopple. Read a short review from the Washington Post. What the numbers say, A Field Guide to Mastering Our Numerical World, by Derrick Niederman & David Boyum. Read a review by ATD here. 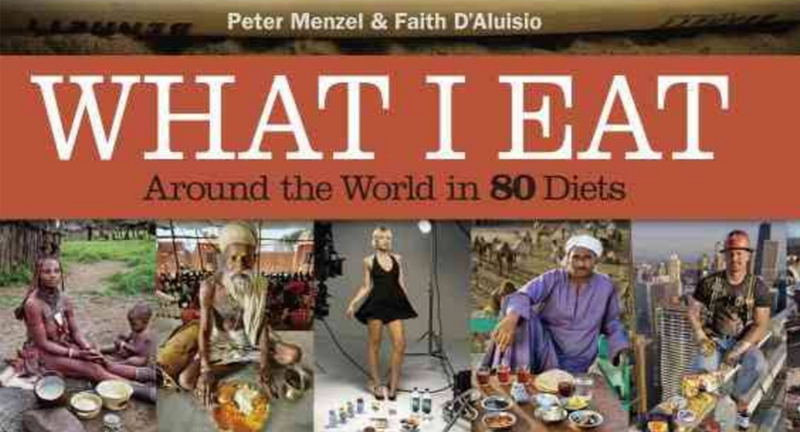 What I Eat: The World in 80 Diets, by photojournalist Peter Menzel and writer Faith D’Aluisio. Read a review by Aaron Spiegel, featured at the Huffington post. ……….We have also received a bunch of other fabulous books, but I just wanted to preview a few that I find interesting. I will let you all know about other new titles in future posts, but any teacher who wants to know what we’ve added can e-mail me and I will send them a complete list of our books orders. This entry was posted in Book Orders, books, LMC announcements and tagged 3D printing, book reviews, Fabricated, Japanese Internment, Liberal Education, new books, recommended books, recommended reading, Sugar Changed The World, What I Eat. Bookmark the permalink.